Learn about the main concepts you are dealing with when working Prisma. Prisma server: A standalone infrastructure component sitting on top of your database. Prisma client: An auto-generated library that connects to the Prisma server and lets you read, write and stream data in your database. It is used for data access in your applications. The datamodel primarily serves as foundation for the API operations of your Prisma client. You can find documentation and examples for all of these operations in the Prisma Client docs. The datamodel is written in .prisma-files and uses GraphQL SDL syntax. SDL is used because it is agnostic of programming languages, simple, expressive and intuitive to use. Manually written: When the datamodel is written manually from scratch, the datamodel is also used to perform database migrations (this only applies for new databases without existing data). The model definitions of the datamodel not only determine the API operations of the Prisma client, but are also mapped to the database (meaning they're used to perform database migrations in a declarative way). Derived from an existing database schema (introspection): When you're starting to use Prisma with an existing database, the datamodel is derived from the existing database schema. In this case, Prisma is not used to perform database migrations (instead, you keep migrating the database manually as you used too). While there currently is a clear rule for when you can use Prisma to perform database migrations and when not, it is planned to unify the two approaches. This means you'll always have the flexibility to perform migrations manually or using Prisma. Learn more. The Post and User models are connected via a relation (defined by the author and posts fields). The ! following a type means that the corresponding field of the model can never be null. The @unique directive is used by Prisma to ensure there'll never be two records that have the same value for this field. The @default directive is used by Prisma to set default values when records of this model are being created. createdAt is not writeable and will be maintained by Prisma, it indicates the exact time when a record was created. There also is updatedAt which indicates the time when a record was last updated. The Prisma client is available in various programming languages and provides type-safe database access. In contrast to traditional ORMs, it provides a seamless API to work with relational data, JOINs and transactions. For traditional ORMs, such a set of write operations requires you to manually control a database transaction. Prisma client handles the transaction for you. The operations exposed by your Prisma client are strongly typed. For any typed programming language, this means that you get compile-time safety for all database operations and you know exactly what shape of data is going to be returned. It also makes for an amazing developer experience where you get auto-completion in your editor. All the typings are auto-generated, so you don't need to deal with writing any boilerplate for that. After you changed your datamodel, you just regenerate your Prisma client and all typings will be updated. Adding a realtime event system to your database is an extremely complicated task. Prisma client lets you subscribe to any database event without having to deal with the underlying infrastructure. You can do so via generated methods on the $subscribe property. The Prisma client lets you run GraphQL queries and mutations against your database using the $graphql method. It needs to be configured with your database connection details and user credentials when being deployed. The main responsibility of the Prisma server is to translate requests made by the Prisma client into actual database queries. Prisma Cloud is a set of tools helping you to manage your Prisma servers and services. It consists of the web-based Prisma Console and parts of the Prisma CLI. You can host a Prisma server anywhere - be it your on own infrastructure or using your favorite cloud provider (such as AWS, Google Cloud, Digital Ocean, ...). No matter where the Prisma server is hosted, you're still able to manage it through Prisma Cloud. This includes maintenance tasks like upgrading the Prisma version. To take advantage of these benefits, you need to connect your Prisma server to Prisma Cloud. 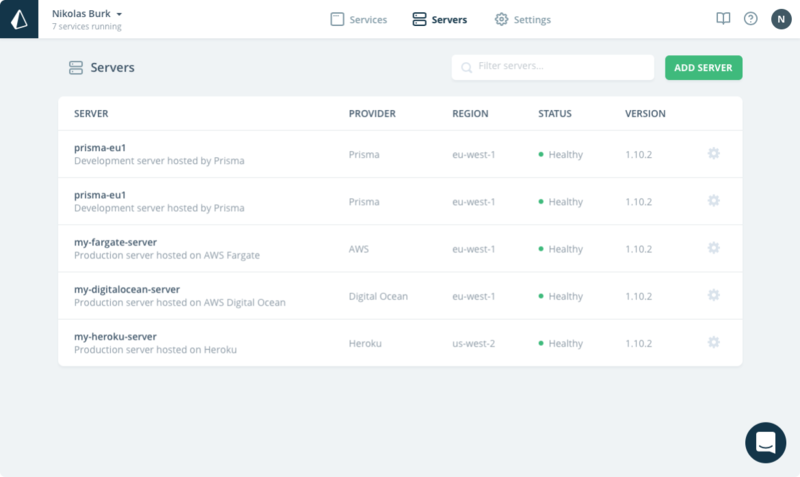 With the cloud provider integrations, you're also able to set up your Prisma server directly through the web UI instead of fiddling around with Docker and the APIs/UIs of your cloud provider. As an example, learn how to setup a new Prisma server with a connected database on Heroku. To get started with Prisma without the hassle of setting up your own database and Prisma server, you can use a free, hosted Demo server in Prisma Cloud. Run prisma init and choose the Demo server option or follow the "Get Start"-tutorial.